The safe was unusual but not particularly challenging for Phil Mortillaro, who was contemplating how to break in. Built by the Lowrie Safe and Lock Company, it had a small round door covered with chipped silver paint. The safe was attached to the bedroom wall of a pre-World War I co-op on West End Avenue. A few days later, Mr. Mortillaro returned with his tool box. The company that had made the safe was defunct, he had discovered, but he had studied similar models. Making what he called a "very educated guess:' he drilled a little hole in the door near the dial and peered inside with a boroscope, the same kind of instrument orthopedists use to look inside a patient's knee. Five minutes later, he had lined up the three wheels of the combination lock and opened the door. Except for a rubber band, the safe was empty. That experience was typical. Not once in his 30-year career has Mr. Mortillaro discovered a cache of any significance. "I always tell my customers not to expect anything," said Mr. Mortillaro, a rugged, bearded 50-year-old. "But it's my policy to ask them to be there when 1 open the door." Mr. Mortillaro is one of the last of a disappearing breed. 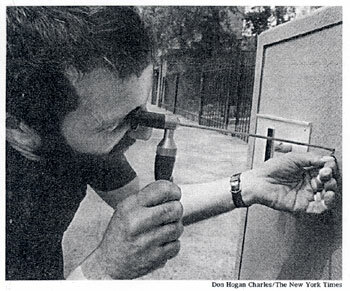 He is a safecracker, an honest one, and he has opened hundreds of safes. 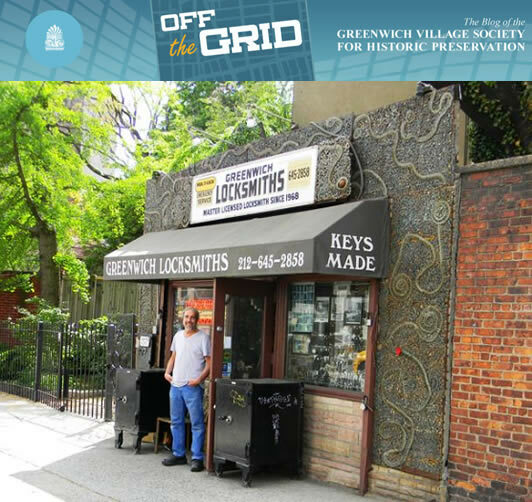 Antique keys and locks dominate the window of his shop, the Greenwich Safe and Lock Company on Seventh Avenue South. On the sidewalk stand half a dozen old cast-iron safes he has rebuilt, along with a few new models. 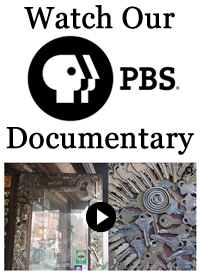 But these days there is little demand for experts who understand the mechanical secrets of cast-iron vaults, and Mr. Mortillaro considers today's safes chintzy by comparison. He also scoffs at the electronic locks. "They're easy to get into," he said. "Ten minutes at most." 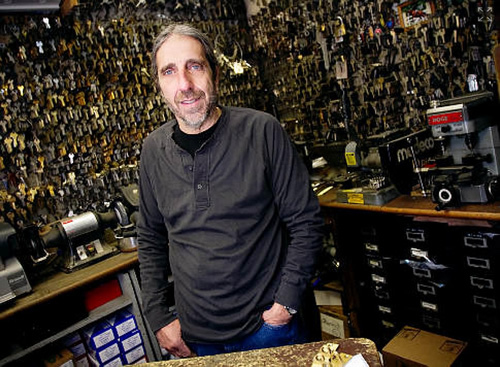 His business has increased recently because the federal government has been moving out of expensive city real estate and old government safes need to be pried open. He has also been asked to open old commercial safes in the Wool- worth Building, part of which will be residential. The myth Mr. Mortillaro likes to puncture is Hollywood's depiction of lock picking. To him, the idea of a safecracker with a stethoscope is laughable. He is especially critical of portable X-rays that can seemingly peer inside steel doors. "I'd like to know the size of the X-ray machine you would need to penetrate a safe where the doors might have two or three inches of solid steel," Mr. Mortillaro said. Mostly, however, today's safecrackers, legal or otherwise, aren't as skilled as those of the past because they don't have to be. "When I first started out, you'd hear about a safe that was drilled open or a lock that was picked," Mr. Mortillaro recalled. "Guys today, they'll walk in and kill four people to get the combination. The old-time burglars never carried a gun. Their line of defense was a good lawyer and some money stashed for a legal defense. Mr. Mortillaro found his calling by accident. He grew up in Astoria, Queens, and never made it past eighth grade. He hung out at Reimer Lock- smiths at Second Avenue and 53rd Street, a business that has been around since 1876, and learned every aspect of the trade. To him, the romance of safecracking is in the journey, not in the discovery of what's inside. 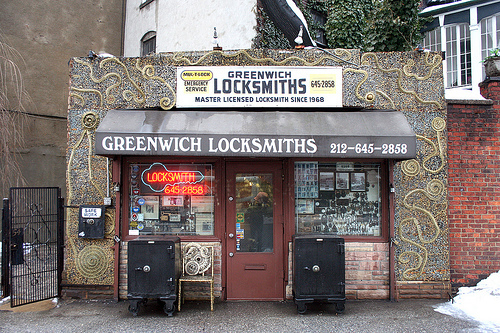 And while every New York neighborhood seems to have a locksmith, few specialists remain. "I'm a dinosaur," Mr. Mortillaro said. 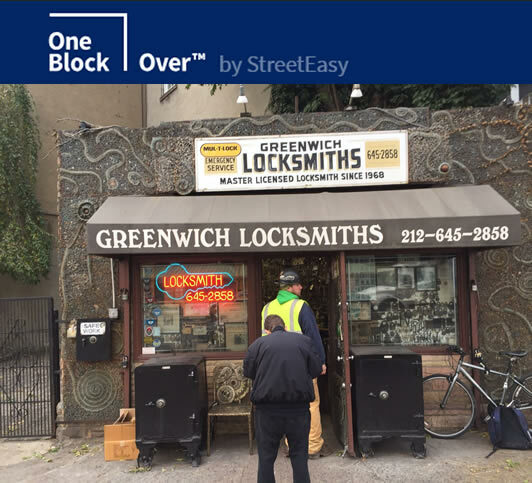 Rocco Leonardis stopped by to get a key made at Greenwich Locksmiths, 56 Seventh Avenue South, near Commerce Street But the proprietor, Philip Mortillaro, had something more challenging in mind. 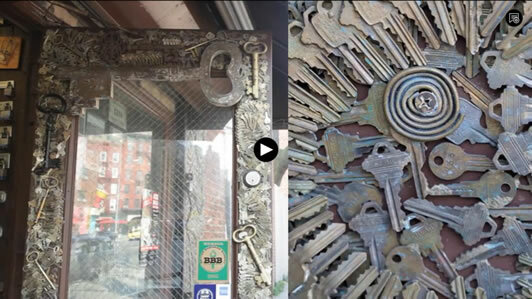 "You're an architect," the locksmith said, "What can I do with this place? It looks like any building on Queens Boulevard, I'm proud to be an American, I'd like you to make this a real American building." What Mr. Leonardis produced, he said, was something "that thinks it looks like an American building." 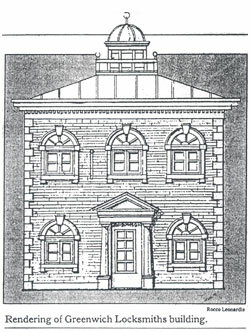 The two-story structure, triangular in plan (19 by 15 by 14 feet), might be called Hyper Colonial, It has columns, a pediment, arched windows with keystones, brick walls edged with' quoins, a dentiled cornice and a copper roof topped by a cupola. The site is in the Greenwich Village Historic District, and Community Board 2 found that the "richly ornamented building" would be out of keeping with the simple, early-19th-century small brick structures characteristic of neighboring Commerce and Bedford Streets," But the Landmarks Preservation Commission gave its unanimous approval. Mr. Mortillaro hopes to be under way early next year, with completion In spring, The new shop will cost more than $100,000, "People say I'm crazy to build It," he said, "but I think it's going to look great. It’s going to add to New York. I think it's going to enhance the business 10 times.